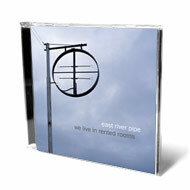 Due February 15, 2011 is We Live in Rented Rooms, the seventh LP from East River Pipe, the musical pseudonym of depressive bedroom-pop auteur F.M. Cornog (see New York’s 2006 feature on ERP here). In anticipation, Merge Records has given Vulture exclusive rights to premiere the record’s pretty, slow-burning “Cold Ground.” Click to listen, then let us know what you think.